Christmas decorations, interpreted in a contemporary way! 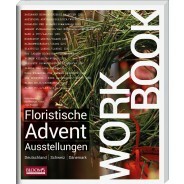 This new book from the workshop of Klaus Wagener and his team contains festive decorations from XXS to XXL for creative crafting lovers and professional florists, do-it-yourself fans and floral designers. It contains a wide variety of ideas and many easy to copy crafting techniques, including written instructions accompanied by pictures, for all those who want to decorate their home with handcrafted creations during the Christmas season. New techniques provide new impulses for creative crafting with natural materials. Whether this book is used as a compendium of ideas, instruction manual or source of stylish inspiration - with more than 300 atmospheric pictures and how-to photographs, it is an essential companion for all Christmas decorating and creative crafting fans.